Maus is a haunting tale within a tale. Vladek’s harrowing story of survival is woven into the author’s account of his tortured relationship with his aging father. Against the backdrop of guilt brought by survival, they stage a normal life of small arguments and unhappy visits. This astonishing retelling of our century’s grisliest news is a story of survival, not only of Vladek but of the children who survive even the survivors. Maus studies the bloody pawprints of history and tracks its meaning for all of us. I first stumbled across this graphic novel while doing research for my paper on The Hobbit graphic novel. Mauswas the first “comic book” to win a Pultizer Prize. It is also credited as one of the first graphic novels. Maus is particularly hard to classify, sometimes called memoir, history, autobiography, fiction, or any mix of genres. Maus recounts a history of the Holocaust in animal form. The Jews are depicted as mice, the Germans as cats, the Polish as pigs, and the Americans as dogs. As in Watchmen, Spielgelman makes full use of what you can do in a graphic novel that you can’t in a book. In one scene, Vladek and his wife Anja are trying to pass themselves off as Polish: Spielgelman depicts them as mice with pig masks on. What I particularly liked about Maus was the way it dealt with the place of the Holocaust in today’s history. Spielgelman is himself a character in the novel. At one point, he goes on a tv show to talk about the first part of Maus (Maus was serialized between 1980 and 1991, and the novel is itself commonly divided into Part 1 and Part 2). In it, Spielgelman is asked the question, “Many younger Germans have had it up to here with Holocaust stories. These things happened before they were even born. Why shouldthey feel guilty?” Though this question is explicitly directed at Germans, I think it applies to much of the young generations. I’m not going to lie and say that I, as an American, don’t feel the same way. Often, the Holocaust is taught so much, but repetitively, without introducing anything new. I’m not going to lie and say that I wasn’t sick to death of it, reading the same books and watching the same films over and over. I wrestled with myself for awhile, feeling completely guilty and selfish for even daring to think such a thing. But it’s true. Last year, I took a graduate film studies seminar on World War II, but more specifically the Holocaust. I was initially apprehensive, as I wasn’t particularly interested in studying it anymore. But I’m glad I took the class. Not only did we read things like Schindler’s List and Primo Levi, we watched films I’d never seen before (Schindler’s List, Inglorious Basterds, Valkyrie, The Reader). We also watched the documentary by Alain Resnais, Night and Fog. For years, I’d wondered if something was wrong with me that watching those made for tv movies and reading The Diary of Anne Frank didn’t make me cry. But this affected me in the way that nothing else had. And then I began to see what the real problem was. The public education system delivers a very watered-down form of the Holocaust and World War II. You’re taught about it in a way that invites an excess of emotion on the part of the teacher, but there are no materials provided that evoke the same response in the student. What you’re left with is this great gap between people who are trying their best to try and get you to feel something with PG materials and students who haven’t got a clue and are annoyed that people keep harping on and on. It wasn’t until I took my college course that I finally got it. Spiegelman provides this answer to the above-mentioned question: “Maybe everyone has to feel guilty. Everyone! Forever!” I liked that Spiegelman approached this question head-on, in the text. The other thing I greatly enjoyed about Maus, is that I think there’s a tendency to over-romanticize World War II, the Allied victory, and the survivors of the camps. What I mean by this is, like many other things, if some person comes through a great trauma, they are often later excused from other bad behaviors. Spiegelman relates a scene in which his father, Vladek, expresses blatant racism against an African-American man. Spiegelman attempts to point out that what Vladek is doing is no different than what the Nazis did to the Jews, but Vladek refuses to see it. I like that Spiegelman had this courage to approach his relationship with his father in a way that doesn’t paint him in a romantic light. 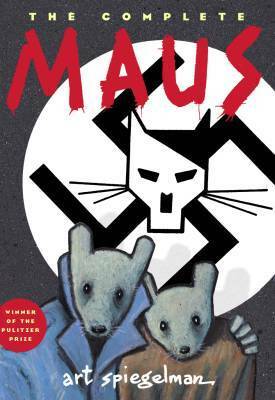 Maus is as much a history of the Holocaust as it is a chronicle of Spiegelman’s relationship with his father. In this, he is honest. He portrays Vladek as a stingy, crotchety old man who makes everyone around him miserable. This is quite different from many of the other treatments we get of Holocaust survivors. In Maus we get a human, rather than romanticized, idealized portrait of an ethnic group. The thing that is so often forgotten is that people are people. Even people who have had great atrocity delivered upon them, do not always transfer that into absolute goodwill toward their fellow man. We are all flawed and faulty, every last one of us. I haven’t read it in awhile, but there it sits, on my shelf, a much loved book. I read Maus I and Maus II in my junior year AP English class and they were absolutely fascinating. Like you said Shannon, too many classes offer a watered down lesson plan on the Holocaust and just WWII in general, Maus is a much clearer version. Thanks for posting this. 🙂 Oh, and just while on the subject, I’m reading a book right now called ‘Night.’ It is also about the Holocaust. Have you ever read it? Night is fantastic! I read it in Sophomore English in HS. I remember taking it home with the instructions to just read the first chapter for the next class and I read the whole thing! hahaha, well done. 😀 Yeah my sister who is a substitute English teacher is having her sixth grade kids read it, and she brought me an extra copy from the class. I was reading it on my way to the recent beach boys concert and read the preface and foreward but haven’t actually gotten into the book yet. Like I you I’ll probably just take an afternoon to read the whole thing, but I’m glad to hear you enjoyed it! Also! My most recent review was for the Japanese film Battle Royale. Have you seen it and or read the book? I know! That’s exactly why I got it. Still though I was going to write a compare and contrast for the website I write for on Battle Royale and The Hunger Games in March when Hunger Games came out, but Battle Royale didn’t even arrive in the mail till this week! grrr…. And you are welcome, also don’t worry about it. I too have been lacking in entries as of recently.